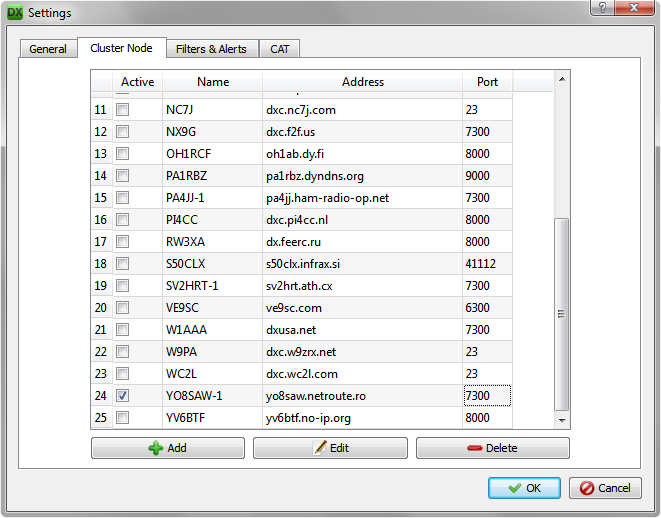 DX Spotter is a DX Cluster client application which offers easy to use filters and alerts. DX Spotter should connect automatically, and you should begin to see spots – no pun intended :). When connected, the icon in the system tray turns green. 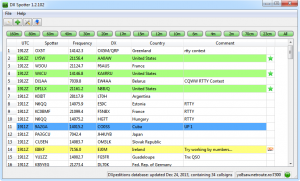 The main window shows the DX spots, a quick-access band filter and the connection status. Every DX spot includes the callsign of the DX station and that of the spotter, UTC time, frequency, the country of the DX station and any additional comments by the spotter. 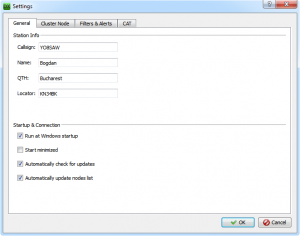 Allows you to quickly disable spots for certain bands. Enabled bands are shown in green, while rejected bands are shown in red. Note: It is important to remember that this band filter is checked before all other filters. For example, if you use the “20m” button to disable the 14MHz band spots, no spots from this band will be displayed, even if you have an “Accept” filter set up in Settings. When DX Spotter is connected to a node, the indicator in the right side of the status bar turns green. When not connected, the indicator is red, and while a connection attempt is being made it turns yellow. For easier assertion of the connection status, the system tray icon is red when disconnected, and green when connected. For each received DX spot, some more details can be obtained by right-clicking anywhere on the spot and selecting Details. A window will appear, displaying any extra available information. For example, callsigns of DXpeditions should have some details about the time frame of the expedition, IOTA information and any additional comments. This is where you must set your station infor mation, like callsign, name, QTH and grid square. You can also choose to have DX Spotter start automatically at boot and to start minimized to the system tray. 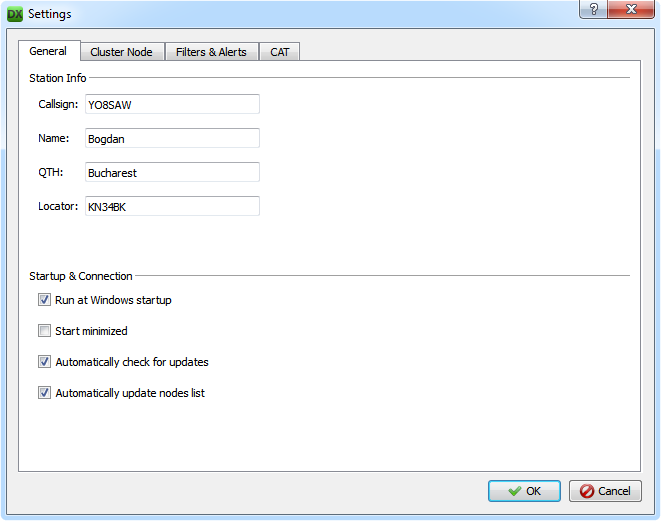 This is a list of the currently available cluster nodes. You can make one of them active by clicking on it, and then clicking OK. If you prefer to connect to a node that isn’t already on the list, simply click Add and fill in the name, address and port. In case you use passwords to connect to the nodes, you can set them for each node separately. This is useful if you have different passwords set for different nodes. There are two sections, one for filters and one for alerts. Use the filters to block spots that are of no interest and the alerts to make the ones that do peak your interest stand out. The filters and alerts are evaluated sequentially, in the order in which they are defined. For example, if you have defined a filter to drop spots from the 20m band and a sound alert for spots on the 20m band, the alert will never be triggered. Note: None of the filters and alerts defined here will be evaluated if the spots don’t pass the band filter configured on the main window. 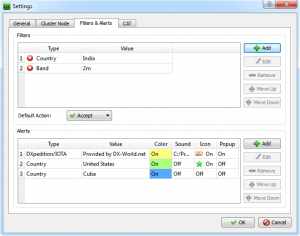 Filters and alerts can be of one of 6 types: Band, Callsign, Country, Active DXpeditions/IOTA, Worked Countries and New Countries. For each filter an action can be specified – Accept or Drop. For spots that don’t match any of the defined filters, the selected default action is applied. DX Spotter has the ability of controlling a transceiver via Ham Radio Deluxe (tuning the rig to the spot’s frequency, or using the rig’s frequency when sending new spots). Note that the CAT module is not installed by default. Thus, the CAT settings tab will offer the possibility of downloading the module. After the download is complete, the rest of the options on the page become available. 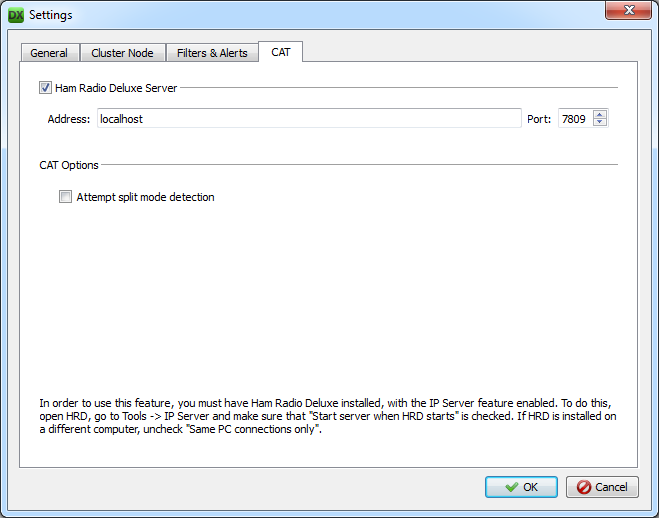 For basic CAT operation it is necessary to check the “Ham Radio Deluxe Server” check box and fill in the address and port of the computer on which HRD is installed. 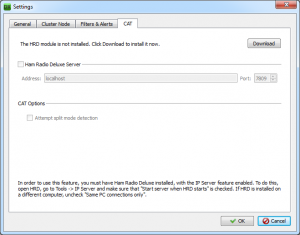 DX Spotter initially assumes HRD is installed on the same computer, and so the default address and port are localhost and 7809, respectively. 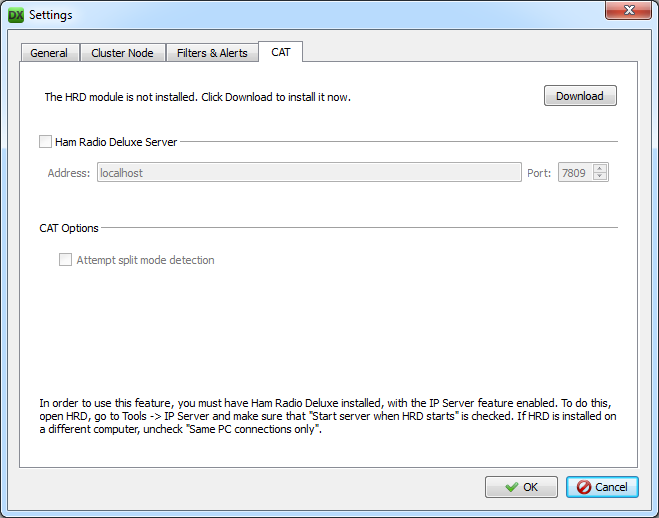 For this to work, the Ham Radio Deluxe IP Server must be enabled by going to Tools -> IP Server and checking “Start server when HRD starts”. If HRD is installed on another computer, you must also uncheck the “Same PC connections only” option. CAT operation is fairly simple. 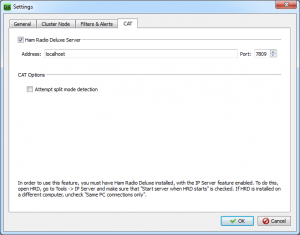 Assuming you already have Ham Radio Deluxe installed with IP Server enabled, and the “Ham Radio Deluxe Server” check box is checked in DX Spotter, all you have to do is double-click (or right-click and choose “Tune Rig”) on a spot to tune your rig to the spot’s frequency. The mode (LSB/USB/CW) should also be set automatically, according to the IARU band plans. While DX Spotter communicates with your transceiver via HRD, a flashing icon – – will be visible in the upper-right corner, just above the “All” button of the band filter. 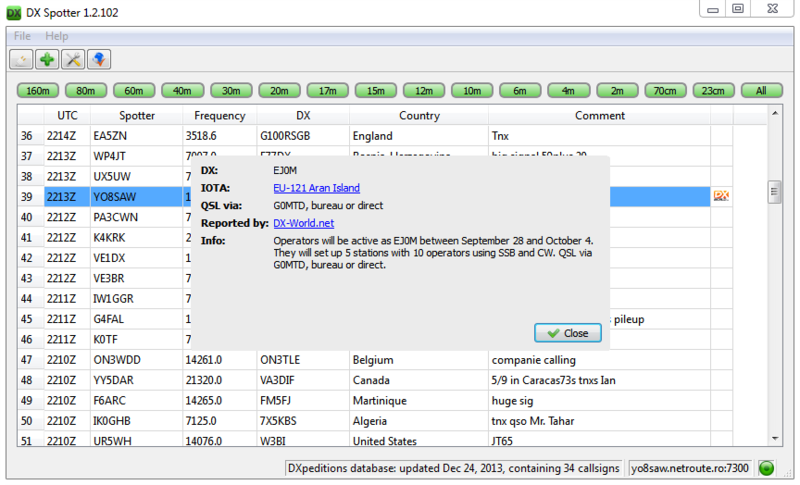 An extra feature of the CAT module is the ability to detect split mode operation by analyzing the comments of the spots. Thus, when double-clicking on a spot, DX Spotter will try to determine if the spotted station is working split and if so, will set the second VFO of the transceiver to a frequency that’s offset by a few KHz above or below the frequency of the spot. 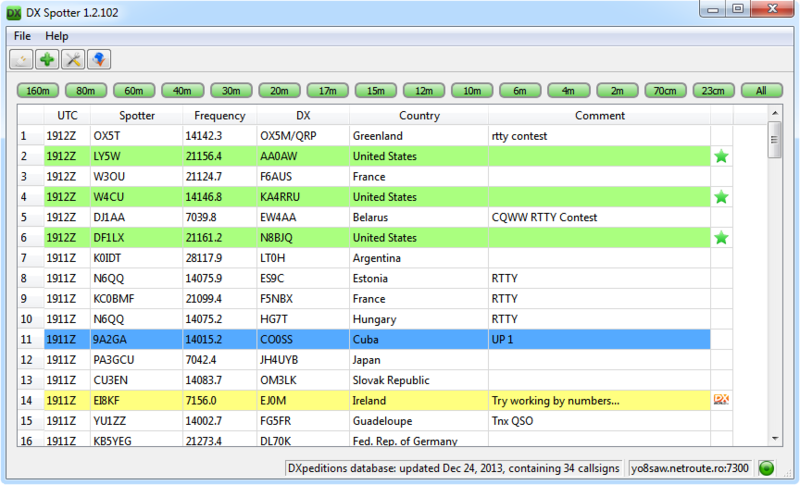 For example, say YO8SAW has been spotted on 14285.0, with the comment “calling cq 5 up”. When you double-click this spot, VFO A of your rig will be set to 14285.0 USB, VFO B will be set to 14290.0 USB, and SPLIT will be activated. Another example: YO8SAW has been spotted on 21006.2 with the comment “cq up”. In this case, VFO A will be set to 21006.2 CW and VFO B to 21007.2 CW. Because the comment only specified “up”, DX Spotter assumes 1KHz for CW. This feature is enabled by checking “Attempt split mode detection” in the CAT tab in Settings. Note: CAT should work with most transceivers supported by Ham Radio Deluxe, but I have only tested it with a few models. If your transceiver is supported by HRD, but does not work properly with DX Spotter, please contact me. 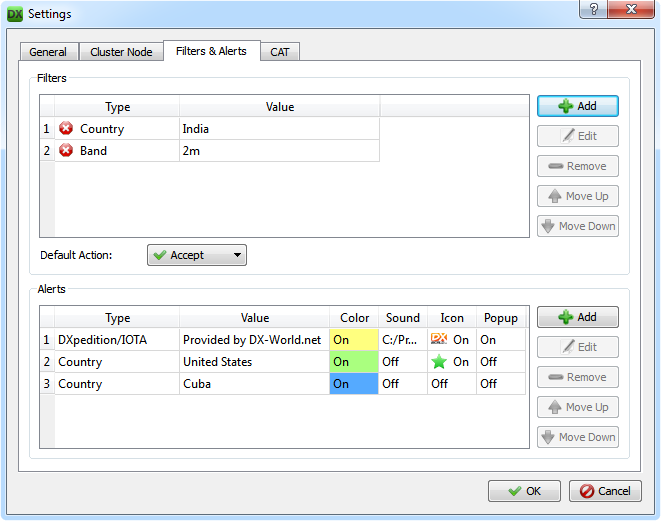 You can access the Worked Countries configuration dialog either from the main window, or from the filter/alert properties dialog. The list on the left contains all the available entities. 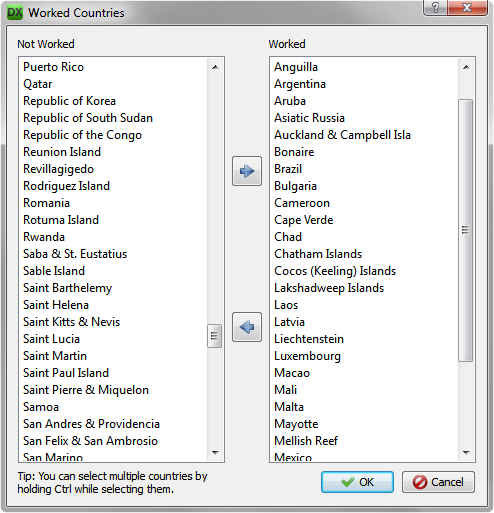 You can move your worked countries to the list on the right by double-clicking them or by clicking and then pressing the blue arrow button. Multiple items can be selected at a time by holding down Ctrl while clicking them. 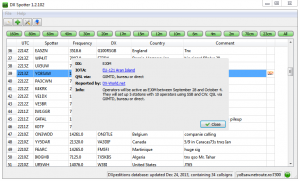 DX Spotter also offers the possibility of sending new spots to the cluster. Go to File -> Send Spot or click on the appropriate button on the tool bar. A window similar to the one to the right should appear. Fill in the two mandatory fields (Frequency, in KHz and Callsign). 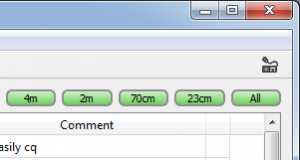 Optionally, enter some comments in the last field, then press OK. In case you ever get curious about how many DX spots have been received by DX Spotter, you can check the Statistics, by going to Help -> Statistics. 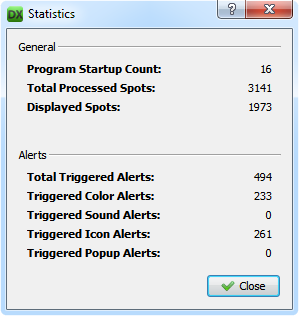 You’ll see a few numbers, like total processed spots, displayed spots and number of different alerts triggered.